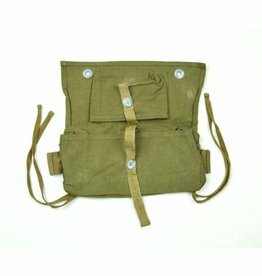 A separate, small, removable bag that would attached to the A-Frame and was for holding the K98 rifle cleaning kit, necessary underclothing and toiletries etc. These were holding 2 mics. and phones (1 set for officer), 1 batterie and an instruction card. The pouch is in used condition, shows some blanco. Marked ZL&TD, dated 1942. 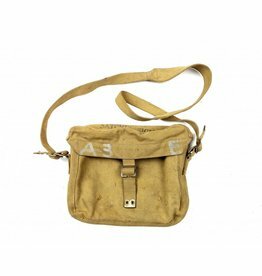 Nice unissued pair of Canadian Basic Pouches. Made by ZL&TD, dated 1943. The case is nicely makers marked ZL&TD with the C broad-arrow and dated 1941. The yellow coloured felt piece is also present! 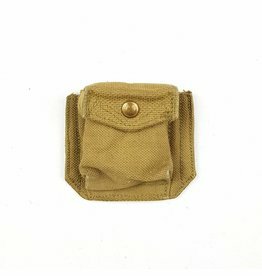 They are virtually the same in construction and design as the ammunition pouch. The compass pouch has felt lined and has fibre board stiffeners.